Where do I use my Furnish your home voucher code? Furnish Your Home is the online home of stylish, affordable home furniture, perfect for everyday living. Your home is one of the most important places in your world which is why Furnish Your Home have spent years designing a wide selection of home interior products! With something to suit all taste including sleek and modern designs to more classic and timeless pieces, Furnish Your Home have got you covered. Shop the variety of bespoke collections where each and everything you find has been carefully created by craftsmen and conjured up by the most talented designers. Find furnishings sculptured from wood, metal, glass and much more! At Furnish Your Home, they aim to inject undeniable style into everything they create ensuring that their traditional collection is combined with contemporary flourishes to keep their lines up to date and on trend. With everything created built on their three cornerstones including quality, function and inspiration you can rest assured you’re in the best hands. With everything from Dining Tables and Coffee Tables to Wall Lights, Sofas, Chairs and Beds! Your living space will be transformed with the help of Furnish Your Home. 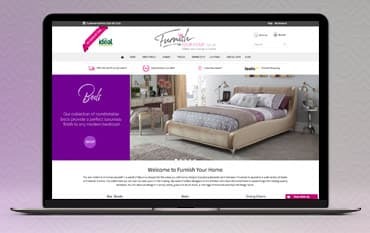 Along with a swift delivery service, you can make great savings when you shop online at Furnish Your HOme by using a Voucher code which you can find right here on our deals page. What better way to spruce up your home than to do it whilst saving money! See what Furnish Your Home can do for your home today. If you’re in search of a little inspiration when it comes to your home, the Furnish Your Home Blog is filled with an abundance of information and advice as well as tips relating to furniture, style and design. Browse through a great array of blog posts featuring Must Have furnishings for your home, how to add a pop of colour to your living space, making your home pet-friendly and so much more! Take a look through the blog now and get inspired. We here at NetVoucherCodes know just how important your home is to you and amazing it feels to create the home of your dreams by adding unique pieces and furnishing personal to you. It’s for this reason that we feature a selection of money-saving deals for Furnish Your Home right here on our page. Sprucing up your home and revitalizing your home furnishings doesn’t have to cost a fortune and with our Discount Codes and savings, you can make a great discount at the checkout. Your bed is your place to call your very own and it’s for this reason that the wide collection of Beds and Bedsteads at Furnish Your home offers a haven of tranquillity - somewhere you can curl up and relax. Whichever style of bed you prefer, whether it be an elegant and romantic bedstead or an upholstered frame including the ottoman bed range - the Furnish Your Home bed selection has got you covered. With size ranging from a small single to a super king, each and every bed exudes comfort and quality whilst the Ottoman selection help maximise your storage needs also. Choose from a range of colours that can effortlessly blend in with your current interior or inspire some changes in your bedroom! From soft rose gold tones to soothing purples, contemporary duck egg or a traditional brass, these designs are created with you in mind. Of course, it’s not just adults beds you can find, Kids will love the collection of bunk beds which can be transformed into 2 singles beds if needs arise. Shop the expansive range today and you won’t be disappointed. If you need to make a return, exchange or replacement, you will need to simply follow the steps listed here on the Returns Page. Immerse yourself in a world of fabulous designs and products for your home with Furnish Your Home. The popular and trusted retailer boasts a wide variety of tastes and interior themes inspired by overseas designers. Discover the work of skilled designers and craftsmen and shop designs in wood, metal, glass and much more - perfect for adding a unique touch to your home. Shop with a Furnish Your Home Discount Code for savings on your next piece of furniture whether it be a dining table or wall pendant, Furnish Your Home appeal to even the most discerning taste.